Diary entry of Aug. 12, 1865 describes how Moore attended the Dan Rice Great Show [a circus] and saw a sideshow tableaux of the assassination of President Lincoln in Bellefontaine, Ohio. [Note: Dan Rice is one of the greatest Civil War era clowns. He dressed and looked like our image of Uncle Sam.] Moore may have been a school district official in Logan County, Ohio. He regularly visited West Liberty, Bellefontaine, Lake Branch, and Degraff, Ohio. 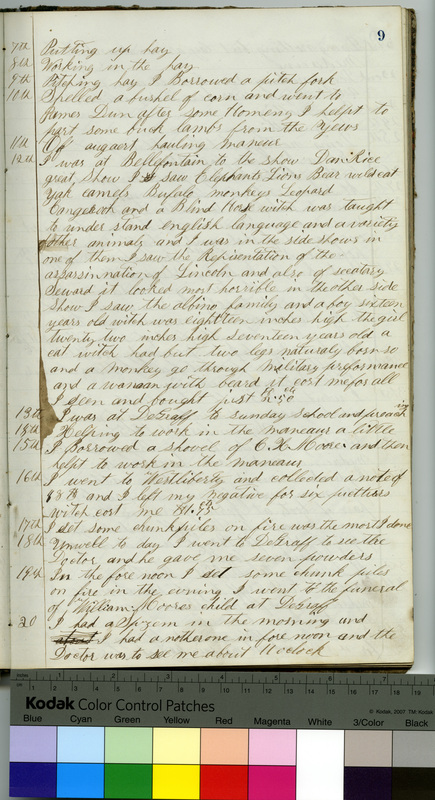 His diary, March 19, 1865-Oct. 1, 1869, gives a daily account of his farming, church, family, social life, and illness in Ohio.